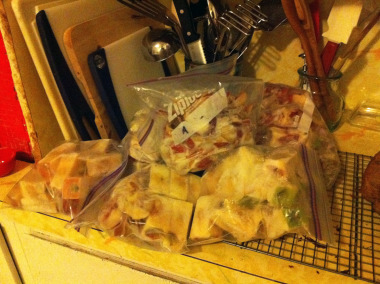 It all started during an evening-long freezer clean-out. We are moving, after all. The scene before me was grim. Turns out I had six bags of apple scraps crammed in there. Hmm. Pectin stock took over my kitchen for four days. Three sealed pints and enough apple-y stock for this batch of not-too-sweet, syrup deliciousness emerged. I also found a frozen pint jar of apple juice extracted during my last adventure with apples for jelly. When the POM wonderful folks offered me a case of juice, I accepted. I knew exactly the fate of this tart, antioxidant-laden bev. Apples and pomegranates make great jarmates. 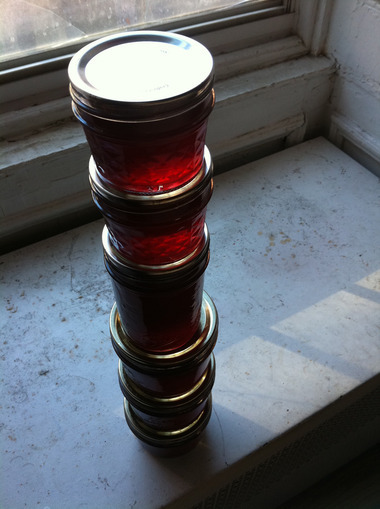 Sterilize your jars for this jelly, since you’re only processing it for 5 min. Start your canner pot water going first and place your empty jars in there when you turn it on. You’ll also heat the jars for ladling into them later! 2. Dissolve 3 cups sugar into the juice mix over low heat. At this point, I dropped a spent vanilla bean (an ice cream-making remnant) into the pot to infuse the syrup. If you have one on hand, give it a try, or all the purists out there should feel free to omit this step. 3. Raise heat to med-high and boil mixture for about 15 minutes, or until your jelly thermometer reads 220 degrees F all around the pan. I love my new jelly thermometer with its corded wire probe!4. Leave 1/2” headspace, wipe rims clean and seal with two-piece lids. Process jars for 5 minutes in enough rapidly boiling water to cover the lids. 5. Wait a week to see if you have jelly or syrup. If you end up with syrup like I think I did, pour it over pancakes, yogurt, ice cream, oatmeal, vodka and soda or whatever could use some tart, sweet kick.